The same off-road and on-water capabilities that make Argo’s XTVs a great choice for outdoor excursions also makes them the perfect tool for extracting injured people from remote locations. When you need to cross mud, water, ice, or even building rubble, an XTV can get to places that are inaccessible to most rescue vehicles. In partnership with one of the world’s premier manufacturers of XTVs also called UTVs, Shank’s Argo offers state-of-the-art amphibious first responder UTVs for various operations. 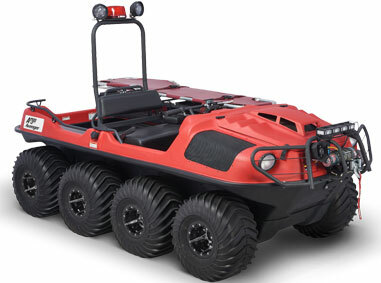 Whether it’s for firefighting, search and rescue, or other similar applications, Argo’s vehicles provide reliability and a no-frills, all-results performance – especially when lives are clearly on the line. The XTV’s water capabilities make it perfect for patrolling coastline, moving between islands and crossing streams, lakes, and rivers. Since it can simply drive into and out of water, there’s no need to switch vehicles or access a dock. When it comes to land travel, the massive tires float over sand, mud, and snow letting it go where other vehicles would sink. Dealing with natural disasters? An Argo has no problem crossing damaged or flooded roadways. Need to make a remote rescue? The vehicle can be configured for transport by helicopter. Argo offers vehicles with mounts designed for stretchers, baskets, oxygen tanks, and other first aid equipment, letting you safely transport individuals out of the field. An XTV can also be equipped with a first aid cabinet and a fire suppression system, letting it serve dual roles as a firefighting vehicle and ambulance. If you need to get people and equipment in the field quickly for rescue operations and HAZMAT response, the vehicle can be set up to seat 6 people, while an amphibious trailer can carry up to a ton of supplies. With capable amphibious search and rescue XTVs, you can be prepared for calamities. Schedule a visit to our showroom today.